The process of manipulation of genes, outside the normal reproductive process of any organism is called genetic modification (GM). Genetic modification is also called as genetic engineering or gene splicing (DNA of an organism is spliced and foreign gene is inserted). Transgenic Plants: Genetic modification of plants is achieved by adding a specific gene or genes to a plant, or by knocking out a gene with RNA. The plants resulting from adding genes are often are called transgenic plants. Cisgenic Plants: Desirable genes from bacteria, plants, and animals are inserted into these plants. Plants in which RNAi is used to silence genes are called Cisgenic plants. 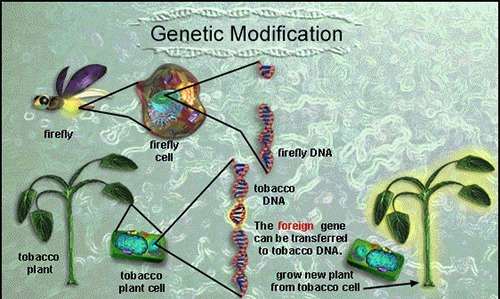 Following procedure is adapted for genetically modifying plants. A genetic construct is designed so that the gene to be added will be expressed by the plant. A promoter to drive transcription and a termination sequence to stop transcription of the new gene, and the genes of interest are introduced to the plant. A marker for the selection Of transformed plants is also included. In the laboratory. antibiotic resistance is a commonly used marker. The plants that have been successfully transformed will grow on media containing antibiotics. The plants that have not been transformed will die. Construct can be inserted in the plant genome by genetic recombination using the bacteria Agrobacterium tumefaciens. A. rhizogenes. or direct methods like the gene gun or micro-injection are also used. Plant viruses are also used to transfer gene into plants. But the technique is limited by the host range of the virus. For exatnple, Cauliflower mosaic virus (CaMV) only infects caulifloweer and related species. The three main uses of GM are the production of insulin from bacteria. Production of erythropoietin in Ovary cells of a Chinese Hamster. Production of OncoMouse also known as “Cancer Mouse” from genetic modification for experimental research.